We’d love your help. Let us know what’s wrong with this preview of A Bus Called Heaven by Bob Graham. How did it get there? Everyone wonders - but nobody knows. Then, out from the shadows steps Stella. She climbs onto the bus and, in a moment, sees everything that it could become: 'This bus could be ours', she says. And so, the lonely old bus - with the help of some colourful graffiti - becomes a hub of activity! To ask other readers questions about A Bus Called Heaven, please sign up. Aww.... Implausible as written, but a good fairy tale for all ages... and plausible if you imagine all the left out details. Anyway, it's a Bob Graham, and I always feel my heart growing stronger and warmer when I read his books. The queen should knight him. Care about diversity? Drive 'A Bus Called Heaven'! “OURS!” little Stella cries in A Bus Called Heaven. That’s the defining moment in Bob Graham’s new book and the words stand alone in a big double-page spread, echoing through his urban landscape. There are thousands of children’s books that celebrate creativity, compassion and fanciful good fun. In fact, as a Baby Boomer who loved reading books to my own kids, I often regret that we didn’t have more of these colorful picture books back when I was Care about diversity? Drive 'A Bus Called Heaven'! There are thousands of children’s books that celebrate creativity, compassion and fanciful good fun. In fact, as a Baby Boomer who loved reading books to my own kids, I often regret that we didn’t have more of these colorful picture books back when I was a kid in the ‘50s and ‘60s. We’ve come a long way in throwing open the windows to childhood imagination. But, to this day—there aren’t that many picture books for kids that specifically tackle the challenges of building a diverse community. Over the years, as a journalist covering cultural diversity, I have highlighted gems about hospitality and diversity for all ages. For example, I’ve been a strong supporter of the delightful mouse-and-bear books by Bonny Becker and Kady MacDonald Denton. (See links below.) As much as we like the tales from that team—they haven’t reached the kind of vivid, clear-eyed vision of diversity that Bob Graham summons in A Bus Called Heaven. In Graham’s world, we see Muslim women in hijab, Orthodox Jews in broad-brimmed fedoras, street kids in hoodies, bikers with tattoos, Hindus in neatly folded caps and Catholic priests in the full regalia of black suit and collar. We meet grandparents, parents and kids. I loved this book. It was inspiring that a young girl could have such an impact on the whole community. The bus becomes a place for people of the community to express their artistic abilities and positive interactions. This community needed this place. When the tow truck takes it away, the community comes together to get it back. One of things that surprised me was connection of the little girl's name as Stella, me I loved this book. It was inspiring that a young girl could have such an impact on the whole community. The bus becomes a place for people of the community to express their artistic abilities and positive interactions. This community needed this place. When the tow truck takes it away, the community comes together to get it back. I don't think there's an author-illustrator who can best Bob Graham at creating community narratives...I really, truly don't. He does such an incredible job of illustrating folks from all walks of life and bringing them together. After a girl named Stella suggests turning the bus into a place where everyone can hang out, each and every person adds something special. This book honestly warms my heart, and I'm so glad I read it. It's definitely worth reading as a child, to a child, and as an a I don't think there's an author-illustrator who can best Bob Graham at creating community narratives...I really, truly don't. He does such an incredible job of illustrating folks from all walks of life and bringing them together. After a girl named Stella suggests turning the bus into a place where everyone can hang out, each and every person adds something special. This book honestly warms my heart, and I'm so glad I read it. It's definitely worth reading as a child, to a child, and as an adult. It's just so sincere and genuine, which are two top-tier traits in my book. According to the May/June 2012 edition of The Horn Book Magazine (pg 66), Bob Graham actually saw a an old bus labeled "Heaven" on the street. He turned the sighting into a lovely and heartwarming community story. I probably wouldn't use it in a program, but I certainly will display it often in the hopes that patrons will enjoy the humor and delight in what this diverse group of characters create together. This reminded me of the feel of Stone Soup . I love how Bob Graham always includes so many different kinds of people in his illustrations. Graham's books are always populated by a charming cross-section of urbanites. In this book they band together to rescue an old bus and make a refuge for the community -- babies to seniors. There are a number of gaps in logic as the story progresses, but the charm of the effort is pleasing. A Bob Graham picture book is always something to look forward to. When an abandoned bus with a hand painted sign that simply says Heaven on it is discovered in front of Stella's house, the whole neighborhood is abuzz with curiosity, including Stella. Loaded with trash and in desperate need of a good wash, Stella sees nothing but possibility. Soon, the bus is transformed to a little bit of heaven as everyone pitches in and fixes it up. And what a wonderful community center for these very diverse neighbors to gather in and spend time getting to know each other. When an abandoned bus with a hand painted sign that simply says Heaven on it is discovered in front of Stella's house, the whole neighborhood is abuzz with curiosity, including Stella. Loaded with trash and in desperate need of a good wash, Stella sees nothing but possibility. Soon, the bus is transformed to a little bit of heaven as everyone pitches in and fixes it up. And what a wonderful community center for these very diverse neighbors to gather in and spend time getting to know each other. Even the birds settle in, building nests in the old engine. It's all good until...the tow truck shows up and off goes Heaven to the junkyard. Will the concerted efforts of Stella's friends and neighbors be enough to save their community bus from a crushing fate? This book is about how a little girl, Stella, wants an abandoned bus to be “ours”. She wants the bus to be a community bus, so the community helps her fix it up. The bus is not like a regular bus, it is a place where community members get together to hang out. They fill the bus with chairs, tables, books, toys, etc. I like this book because it shows a community coming together to make something great. I think this book is cute and funny, and I love Stella’s determined personality. This book shows how a neighbor can come together and work on something as a team to change they way they view the world. Great problem solving skills. Theodore and I read in morning. Very good. This lovely story is about a neighbourhood coming together to make a derelict bus a space for everyone. The action is child-led and won CBCA Picture Book of the Year 2012. What a sweet story! There's lots to look at in the illustrations. I particularly like that the rabbi, the priest, and the imam (?) are always standing right next to each other, looking pensive. My first Bob Graham picture book. I think I want to read more. I love reading this book because it has a bus in it! A neighborhood comes together when an abandoned bus is left in their neighborhood. Having heard that Bob Graham was like Australia's Robert Munsch, I was really excited to read this CBCA-nominated title. I was really disappointed. It is a needlessly long-winded story about some people who come together over a bus that someone names Heaven for absolutely no reason at all. The only way this story induces any pleasure for me is if I imagine it as an allegory for the mass suicide of an entire city neighbourhood. Not going to be recommending it like that to any parents anytime soon Having heard that Bob Graham was like Australia's Robert Munsch, I was really excited to read this CBCA-nominated title. I was really disappointed. It is a needlessly long-winded story about some people who come together over a bus that someone names Heaven for absolutely no reason at all. The only way this story induces any pleasure for me is if I imagine it as an allegory for the mass suicide of an entire city neighbourhood. Not going to be recommending it like that to any parents anytime soon, though. It keeps on winning awards, which I can only think is because the awards people regret not giving Graham an award for an earlier work that is much better, or maybe they feel like it's time he got an award since he's written so much and everyone seems to love him. The comparison with Munsch seems to be that they have both written hella tonnes and lots of people who grew up with him have an eternally soft spot in their heart for his books. I'd read something else by him if it was recommended by someone who never read any of his books as a child. Until then, the Australian people have lost their picture book recommending credibility. I love that the conflict was decided over a game of foosball. Bob Graham stories always have an interesting plot line that is resolved in ways that are unexpected. Every time I read a new Bob Graham book, I nearly always think it's my new favourite Bob Graham book—but this time it might really be my all-time favourite Bob Graham book. A battered old bus turns up one day, parked on the street outside Stella's house, sporting a cardboard sign proclaiming it "Heaven". And the neighbourhood is transformed from that day on. I saw Bob Graham at the KOALA (Kids Own Australian Literature Awards) 25th anniversary last week, and embarrassed myself by getting teary te Every time I read a new Bob Graham book, I nearly always think it's my new favourite Bob Graham book—but this time it might really be my all-time favourite Bob Graham book. A battered old bus turns up one day, parked on the street outside Stella's house, sporting a cardboard sign proclaiming it "Heaven". And the neighbourhood is transformed from that day on. I saw Bob Graham at the KOALA (Kids Own Australian Literature Awards) 25th anniversary last week, and embarrassed myself by getting teary telling him how much I loved this book. I've been very despondent with the state of the world lately, and this book reminds me of the way things can and should be—full of the love and ingenuity and resourcefulness and pleasure in sharing of ordinary people. Of the importance of community, and how a kind of ground-roots determination can win out against "regulations". So yes, I love this book. Keep an eye on Stella, and while you're at it, note how brilliantly Bob uses light and perspective in this book. My only quibble? No cats. It all started when the bus with a sign that said “heaven” was abandoned on Stella’s street. Traffic slowed, people gathered, and Stella took her thumb out of her mouth and suggested that the abandoned bus could be “ours.” So everyone helped move it out of the street and into Stella’s front yard. It stuck out a bit into the sidewalk and took up the entire yard. The next morning when Stella looked out her window, things had changed again. Now there were people sitting on their front wall, childre It all started when the bus with a sign that said “heaven” was abandoned on Stella’s street. Traffic slowed, people gathered, and Stella took her thumb out of her mouth and suggested that the abandoned bus could be “ours.” So everyone helped move it out of the street and into Stella’s front yard. It stuck out a bit into the sidewalk and took up the entire yard. The next morning when Stella looked out her window, things had changed again. Now there were people sitting on their front wall, children wrestling in the grassy shade under the bus. The adults began cleaning things up. When some boys spray painted the side of the bus one night, they were invited back to paint one of Stella’s designs instead. The bus had become a hub of activity for the entire community. But then one Saturday morning things changed again, when a tow truck arrived. What will happen next to the bus called heaven? One day, Stella finds an abandoned bus outside her house with a hand-painted sign taped to it that says 'Heaven'. With the help of her multi-racial community, the bus is pushed into her front yard, cleaned out and refurbished. Even some local vandals are put to good use by painting a bright mural on the side. Before long, the bus is being used as a community centre where people can chat, read or play games. All goes well until a tow truck driver arrives with a council ordinance declaring that th One day, Stella finds an abandoned bus outside her house with a hand-painted sign taped to it that says 'Heaven'. With the help of her multi-racial community, the bus is pushed into her front yard, cleaned out and refurbished. Even some local vandals are put to good use by painting a bright mural on the side. Before long, the bus is being used as a community centre where people can chat, read or play games. All goes well until a tow truck driver arrives with a council ordinance declaring that the bus is causing an obstruction. He carts it off to the wreckers, with all of the neighbours tagging along. Will Stella come up with a plan to save the bus called 'Heaven' or will it be smashed to smithereens? A really detailed little picture book about a little girl who, with the backing of her town, claims a dilapidated bus set for removal for their own. The text and pictures are very small, so this is more of a one-on-one type of book, but it's a sweet story. What's really interesting to me, though, is that through the amount of detail in the illustration, there's a lot of diversity represented in the depictions of the people in the town. There are gay couples/families, Muslim women in hijab, biker A really detailed little picture book about a little girl who, with the backing of her town, claims a dilapidated bus set for removal for their own. The text and pictures are very small, so this is more of a one-on-one type of book, but it's a sweet story. What's really interesting to me, though, is that through the amount of detail in the illustration, there's a lot of diversity represented in the depictions of the people in the town. There are gay couples/families, Muslim women in hijab, bikers with tattoos--quite a smorgasbord of people. It's not in an in-your-face kind of way, either, just in a way that adds to the scenery. Nevertheless, I noticed it and thought it was neat to see a diverse town not only in skin color, but in ideology, represented. 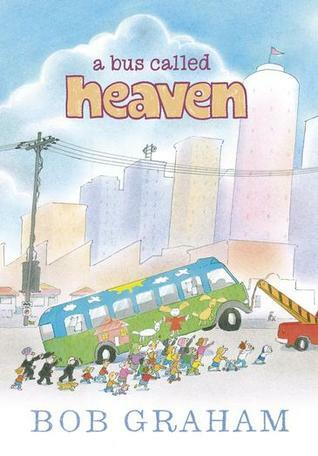 Honestly, the story itself is a bit cheesy for me (a bus called 'heaven?' really?) but I'm sure children will enjoy it. Going solely off of the title of the book, I assumed that the theme and subject matter were going to be entirely different then how they had turned out. I assumed that the prominent theme would deal with death, and I was pleasantly surprised when it didn't take that road. A little girl named Stella discovers a dilapidated bus that has seemingly appeared out if nowhere in the middle of the night. The bus has a sign on it that reads "Heaven." In this picture book by Bob Graham, readers follow Stel Going solely off of the title of the book, I assumed that the theme and subject matter were going to be entirely different then how they had turned out. I assumed that the prominent theme would deal with death, and I was pleasantly surprised when it didn't take that road. No one else depicts an urban, working-class setting and characters in picture books today as authentically and whimsically as Bob Graham. He is the master, depicting humans in all their honest, real glory. Moms and Dads with tattoos, men with earrings, potbellies hanging out, working mothers with rocking hair, Graham captures them all. Don't let the word "Heaven" fool you - this book is all about community building and belonging. It belongs on the shelves of public schools all over, urban and ru No one else depicts an urban, working-class setting and characters in picture books today as authentically and whimsically as Bob Graham. He is the master, depicting humans in all their honest, real glory. Moms and Dads with tattoos, men with earrings, potbellies hanging out, working mothers with rocking hair, Graham captures them all. Don't let the word "Heaven" fool you - this book is all about community building and belonging. It belongs on the shelves of public schools all over, urban and rural. I really liked the sentiment behind this book - that a community full of diverse people can come together around a common cause and make their world a better place. In Stella's town we see people of many religious faiths, as evidenced by their various religious garb (head scarves, yarmulkes, turbans, priest collars, etc. ), and also of every color and age. Young and old, bikers and nuns, alike come together to create a community refuge inside of an abandoned bus dubbed "Heaven." The illustrations I really liked the sentiment behind this book - that a community full of diverse people can come together around a common cause and make their world a better place. In Stella's town we see people of many religious faiths, as evidenced by their various religious garb (head scarves, yarmulkes, turbans, priest collars, etc. ), and also of every color and age. Young and old, bikers and nuns, alike come together to create a community refuge inside of an abandoned bus dubbed "Heaven." The illustrations are quite detailed and would be a lot of fun for kids who enjoy the nose-up-against-the-book studying of a Where's Waldo.